So many celebrities have used their body as a canvas for tattoos — and even more, have restored their bodies by utilizing tattoo removal services. Have you ever wondered who the tattoo experts are who inked (and in some cases re-inked) some of your favourite celebrities? 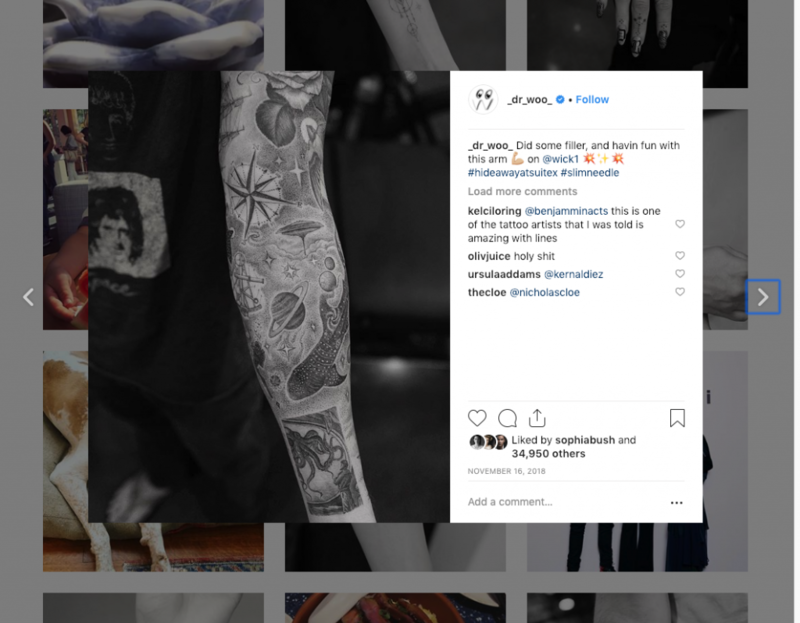 The tattoo artists trusted by celebrities are masters of their craft, which is why we love to follow them on Instagram. They never fail to post pictures of their work – including the work they do on the bodies of notable A-listers. These artists will fill your Instagram feed with intricate, detailed tattoos that will probably inspire you to get some new ink of your own, or even remove an old tattoo to provide a fresh slate for some new art. At Baywood Laser & Cosmetic Clinic in downtown Toronto, we understand the significance of tattoos – and why you may want one removed. Whether you are looking to erase your tattoo to make room for a new one, or just want it off altogether, we’re happy to offer tattoo removal services. We are tattoo removal experts who use state-of-the-art lasers to remove your tattoo. When you visit us, you can have peace of mind knowing that your treatment will be personally performed by one of our doctors. All you have to do is send us a photo, and we’ll get in touch about the cost and how many visits you’ll need to remove your tattoo! You can meet our team of doctors to get any of your questions answered and learn more about your options when you choose Baywood Clinic for your tattoo removal needs. These ink-credible celebrity tattoo artists will inspire you to make some new decisions about your tattoo (or tattoos), whether that be to cover it up, replace it, or remove it. This celebrity tattoo artist has inked the bodies of models and musicians alike – and that’s not even the most impressive thing about him. His tattoos are detailed, intricate and impeccably done. Luckily, he puts all of his artwork on display on his Instagram account! When you follow him, you can definitely expect some celebrity guest appearances on your feed as well. Mr. K’s portfolio of tattoos ranges from quirky drawings to detailed animals to intricate sleeves. The best part is that we get to see all of his work on Instagram alongside some fun pictures of him and his friends. His posts achieve the perfect work/life balance so that you can really get a feel for him personally as well as his work. This Aussie tattoo artist will fill your Instagram feed with stunning caricatures of your favourite characters and musicians. Her art is fun, quirky, and above all incredibly unique. This LA tattoo artist’s Instagram feed boasts a stunning greyscale aesthetic. He posts beautiful black and white shots of his artwork, and it leaves us in awe every single time. His work is minimalist but incredibly intricate. If you love dainty or geometric tattoos, we can guarantee you will fall in love with his work. LA tattoo artist Doctor Woo is responsible for some of the most intricate tattoos on some of our favourite celebrities. His realistic depictions of animals, flowers and even objects will make your jaw drop. It’s no wonder why he’s considered the most in-demand tattoo artist in the world. After a decade of experience at Shamrock Social Club, Woo went solo and opened HIDEAWAY at Suite X – but you’re lucky if you get an appointment. The studio’s location is kept top secret. This New York-based tattoo artist’s work is so intricate you’ll have to look twice. Black and white, coloured, dainty, elaborate – you name it, and he can do it. He’s responsible for a lot of Rihanna’s body art – and if that isn’t a testament to his talent, we don’t know what is. The best part? His Instagram bio says his parlour is open for walk-ins! There’s a lot to love about this UK tattoo artist for the stars. Not only is he responsible for Ed Sheeran’s iconic lion tattoo across his chest, but his he keeps everyone updated on his work on Instagram. Where to Find Him: Lowrider Tattoo Studios. Few people can complete a tattoo sleeve quite like Johnny Opina. His Instagram is almost exclusively his elaborate sleeve work, as well as some stand out back tattoos. Hit that follow button and prepare to be amazed. It’s time to follow this semi-retired tattoo artist for the simple reason that he is responsible for most of Jonny Depp’s iconic tattoos. Nowadays, he’s travelling between California, NYC and Rio de Janeiro which makes his feed that much more exciting. Mark Mahoney is an industry legend with three decades of experience under his belt. The Shamrock Social Club owner has inked countless celebrities and has made a name for himself as the “founding father” of black and grey single needle tattoo style. While his Instagram has some sweet shots, for tattoo artwork you’re going to want to follow Shamrock Social Club – you’ll get to peek at the work done by other stellar artists at the parlour while you’re at it! Baywood Laser & Cosmetic Clinic offers high-quality tattoo removal in downtown Toronto. We staff our clinic with licenced and experienced doctors who are happy to provide our trusted treatment. If you have any questions, you can always call us to learn about our tattoo removal services; cost and amount of sessions are dependent on the colour and size of your tattoo so we encourage you to book a consultation to discuss your unique removal needs. Yup. You knew it had to come. Celebrity tattoo artists? Out. Celebrity Television Series Tattoo shops? In! A new tattoo shop is opening up in London, and you guessed it! It’s Game of Thrones themed from top to bottom. Wonder if this is the start of a new trend? We could have a Sons of Anarchy Tattoo shop – lots of ideas from that show. Or Breaking Bad? Jesse had some cool tats! It sounds like a fun idea, a bit like the Big Lebowski themed bar in Iceland. Hey that’s where Game of Thrones was filmed! But as we always warn patients, be careful when choosing an actual tattoo design based on something that’s currently in fashion – a tv show or an entertainer, for example. Because what’s in today can easily be out tomorrow. You know, like the guy down the street with the huge Mr. Spock tattoo on his back!